This article is about Apophony as a general linguistic term. For Ablaut in a specifically Indo-European context, see Indo-European ablaut. Not to be confused with Apophenia. In linguistics, apophony (also known as ablaut, (vowel) gradation, (vowel) mutation, alternation, internal modification, stem modification, stem alternation, replacive morphology, stem mutation, internal inflection etc.) is any sound change within a word that indicates grammatical information (often inflectional). The difference in these vowels marks variously a difference in tense or aspect (e.g. sing/sang/sung), transitivity (rise/raise), part of speech (sing/song), or grammatical number (goose/geese). The vowel alternation between i and a indicates a difference between present and past tense in the pair sing/sang. Here the past tense is indicated by the vowel a just as the past tense is indicated on the verb jump with the past tense suffix -ed. Likewise, the plural suffix -s on the word books has the same grammatical function as the presence of the vowel ee in the word geese (where ee alternates with oo in the pair goose/geese). Most instances of apophony develop historically from changes due to phonological assimilation that are later grammaticalized (or morphologized) when the environment causing the assimilation is lost. Such is the case with English goose/geese and belief/believe. Apophony may involve various types of alternations, including vowels, consonants, prosodic elements (such as tone, syllable length), and even smaller features, such as nasality (on vowels). The sound alternations may be used inflectionally or derivationally. The particular function of a given alternation will depend on the language. The vowel alternation may involve more than just a change in vowel quality. In Athabaskan languages, such as Navajo, verbs have series of stems where the vowel alternates (sometimes with an added suffix) indicating a different tense-aspect. Navajo vowel ablaut, depending on the verb, may be a change in vowel, vowel length, nasality, and/or tone. For example, the verb stem -kaah/-ką́ "to handle an open container" has a total of 16 combinations of the 5 modes and 4 aspects, resulting in 7 different verb stem forms (i.e. -kaah, -kááh, -kaał, -kááł, -ka’, -ká, -ką́). [dy] "two (masculine)" [dyː] "two (feminine)"
Prosodic alternations are sometimes analyzed as not as a type of apophony but rather as prosodic affixes, which are known, variously, as suprafixes, superfixes, or simulfixes. luba "to be lost" lufya "to cause to be lost"
koma "to be deaf" komya "to cause to be deaf"
pona "to fall" ponya "to cause to fall"
enda "to walk" endesha "to cause to walk"
lunga "to hunt" lunsha "to cause to hunt"
kula "to grow" kusha "to cause to grow"
Celtic languages are well known for their initial consonant mutations. In Indo-European linguistics, ablaut is the vowel alternation that produces such related words as sing, sang, sung, and song. The difference in the vowels results from the alternation (in the Proto-Indo-European language) of the vowel e with the vowel o or with no vowel. To cite a few other examples of Indo-European ablaut, English has a certain class of verbs, called strong verbs, in which the vowel changes to indicate a different grammatical tense-aspect. As the examples above show, a trade in the vowel of the verb stem creates a different verb form. Some of the verbs also have a suffix in the past participle form. In Indo-European linguistics, umlaut is the vowel alternation that produces such related words as foot and feet or strong and strength. The difference in the vowels results from the influence (in Proto-Germanic or a later Germanic language) of an i or y (which has since been lost) on the vowel which (in these examples) becomes e.
To cite another example of umlaut, some English weak verbs show umlaut in the present tense. Germanic a-mutation are processes analogous to umlaut but involving the influence of an a (or other non-high vowel) or u respectively instead of an i. In Indo-European historical linguistics the terms ablaut and umlaut refer to different phenomena and are not interchangeable. Ablaut is a process that dates back to Proto-Indo-European times, occurs in all Indo-European languages, and refers to (phonologically) unpredictable vowel alternations of a specific nature. From an Indo-European perspective, it typically appears as a variation between o, e, and no vowel, although various sound changes result in different vowel alternations appearing in different daughter languages. Umlaut, meanwhile, is a process that is particular to the Germanic languages and refers to a variation between back vowels and front vowels that was originally phonologically predictable, and was caused by the presence of an /i/ or /j/ in the syllable following the modified vowel. From a diachronic (historical) perspective, the distinction between ablaut and umlaut is very important, particularly in the Germanic languages, as it indicates where and how a specific vowel alternation originates. It is also important when taking a synchronic (descriptive) perspective on old Germanic languages such as Old English, as umlaut was still a very regular and productive process at the time. When taking a synchronic perspective on modern languages, however, both processes appear very similar. For example, the alternations seen in sing/sang/sung and foot/feet both appear to be morphologically conditioned (e.g. the alternation appears in the plural or past tense, but not the singular or present tense) and phonologically unpredictable. By analogy, descriptive linguists discussing synchronic grammars sometimes employ the terms ablaut and umlaut, using ablaut to refer to morphological vowel alternation generally (which is unpredictable phonologically) and umlaut to refer to any type of regressive vowel harmony (which is phonologically predictable). Ambiguity can of course be avoided by using alternative terms (apophony, gradation, alternation, internal modification for ablaut; vowel harmony for umlaut) for the broader sense of the words. лам lam "mountain" лаьмнаш lämnaš "mountains"
мотт mott "language" меттанаш mettanaš "languages"
hilhali "I'm dancing" akhi'lho "I'm not dancing"
A diagram of an autosegmental representation of the Arabic word Muslim within linguistic theory. This differs from an analysis based on apophony. Other analyses of these languages consider the patterns not to be sound alternations, but rather discontinuous roots with discontinuous affixes, known as transfixes (sometimes considered simulfixes or suprafixes). Some theoretical perspectives call up the notion of morphological templates or morpheme "skeletons". It would also be possible to analyze English in this way as well, where the alternation of goose/geese could be explained as a basic discontinuous root g-se that is filled out with an infix -oo- "(singular)" or -ee- "(plural)". Many would consider this type of analysis for English to be less desirable as this type of infixal morphology is not very prevalent throughout English and the morphemes -oo- and -ee- would be exceedingly rare. Another analytical perspective on sound alternations treats the phenomena not as merely alternation but rather a "replacive" morpheme that replaces part of a word. In this analysis, the alternation between goose/geese may be thought of as goose being the basic form where -ee- is a replacive morpheme that is substituted for oo. This usage of the term morpheme (which is actually describing a replacement process, and not a true morpheme), however, is more in keeping with Item-and-Process models of morphology instead of Item-and-Arrangement models. Here the words are formed by a reduplication of a base and an alternation of the internal vowel. Look up apophony in Wiktionary, the free dictionary. ^ Beyer, Klaus; John F. Healey (trans.) (1986). The Aramaic Language: its distribution and subdivisions. Göttingen: Vandenhoeck und Ruprecht. p. 44. ISBN 3-525-53573-2. Anderson, Stephen R. (1985). Inflectional morphology. In T. Shopen (Ed. ), Language typology and syntactic description: Grammatical categories and the lexicon (Vol. 3, pp. 150–201). Cambridge: Cambridge University Press. (Especially section 1.3 "Stem modifications"). Asher, R. E. (Ed.). (1994). The Encyclopedia of language and linguistics. Oxford: Pergamon Press. ISBN 0-08-035943-4. Bauer, Laurie. (2003). Introducing linguistic morphology (2nd ed.). Washington, D.C.: Georgetown University Press. Bauer, Laurie. (2004). A glossary of morphology. Washington, D.C.: Georgetown University Press. Hamano, Shoko. (1998). The Sound-Symbolic System of Japanese. CSLI Publications,Stanford. Haspelmath, Martin. (2002). Understanding morphology. London: Arnold. Kula, Nancy C. (2000). 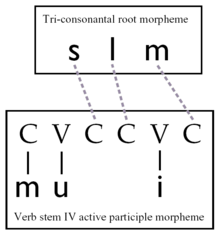 The phonology/morphology interface: Consonant mutations in Bemba. In H. de Hoop & T. van der Wouden (Eds. ), Linguistics in the Netherlands 2000 (pp. 171–183). Amsterdam: John Benjamins. Nguyễn, Đình-Hoà. (1997). Vietnamese: Tiếng Việt không son phấn. Amsterdam: John Benjamins Publishing Company. ISBN 1-55619-733-0. Sapir, Edward. (1921). Language: An introduction to the study of speech. New York: Harcourt, Brace & Co.
Spencer, Andrew; & Zwicky, Arnold M. (Eds.). (1998). The handbook of morphology. Oxford: Blackwell. Young, Robert W., & Morgan, William, Sr. (1987). The Navajo language: A grammar and colloquial dictionary (rev. ed.). Albuquerque: University of New Mexico Press. ISBN 0-8263-1014-1.